If you want the best quality on the market, then you need an updated technology, and that’s a valid statement for most gadgets. So why not scopes too? The best Gen 3 night vision scopes will amaze you in terms of performance, helping you see exponentially better at night. And since choosing one can be a chore, we’re here to help. We’ll start by offering you some input regarding the factors that influence your choice, then proceed with eight great reviews of products to consider. There are plenty of factors to consider before getting a gen 3 scope for your rifle, but the most important are the ones listed below. You might decide on an actual rifle scope if you’re set on using this for tactical purposes, but you can also get something else. A monocular can be used in lieu of a scope if it comes with the appropriate mount, but you can use it for other purposes too. The disadvantage would be that a monocular doesn’t have a reticle for aiming accuracy. Or, you can get a transformation system, that turns your day vision devices into night vision devices. That’s courtesy of the included infrared bulb, and the main benefit here would be versatility. On the other hand, it’s pretty expensive. Get the appropriate dimensions for your purposes. The bigger the magnification, the further away you can shoot. However, your field of view will be decreased considerably along with a higher magnification. 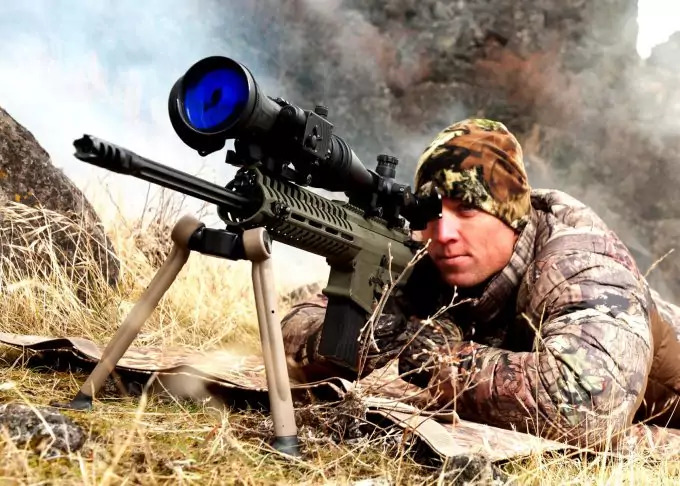 The good news is that most gen 3 night vision devices allow a pretty good distance of a few hundred yards, unlike the gen 1 devices with which 100 yards is considered good enough. The lens diameter is another feature to consider. The bigger the diameter, the more light will be able to pass through the lens, so you can get a bright image. The higher the resolution, the better you will see. But that’s also courtesy of a reliable image intensifier tube. And though the image might be black and white at night, you’ll still see precise details at a satisfactory distance. 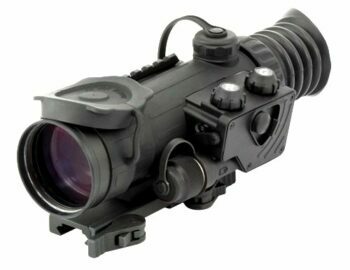 You need a powerful infrared light to see at increased distances. The 850 nm wavelength is among the most high powered, but a 450 nm can still do the trick for brush hunting. 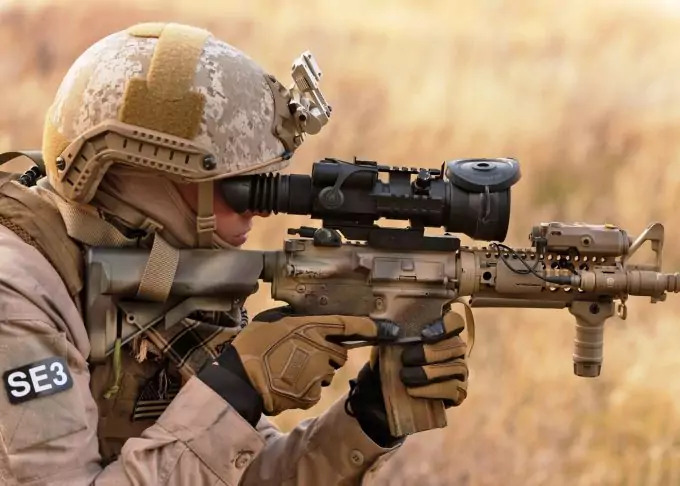 The idea would be that your scope’s infrared isn’t visible to your game, whether you’ll be using it for tactical purposes or night time observation. You need a reliable scope that can withstand your tactical purposes, which is why it’s good to make sure it’s built from resistant materials. Aluminum or titanium for the body is considered the best today, seeing as they’re so sturdy. A nitrogen purged scope is also great because it prevents internal fog, but the whole thing should be resistant to water, fog, and dust. It’s even better if you get a weatherproof device, though, and the best optics are those made entirely out of glass, with multiple layers of coating. 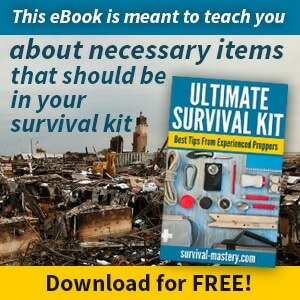 It’s always a good idea to see what other items are included in the package. For instance, a certain scope might allow different magnifications if you’re using the proper lens converters, but that might not be included. Or you might be told that a monocular can be mounted on your head or a helmet, but that can’t happen without the proper mount. So you must be really careful what you choose if you don’t want to spend too much on the side. Plus, it’s always nice to see complimentary extras, like a hard case for portability, lens caps for dust proofing or a good warranty. That said, let’s see what the market has in store for us. 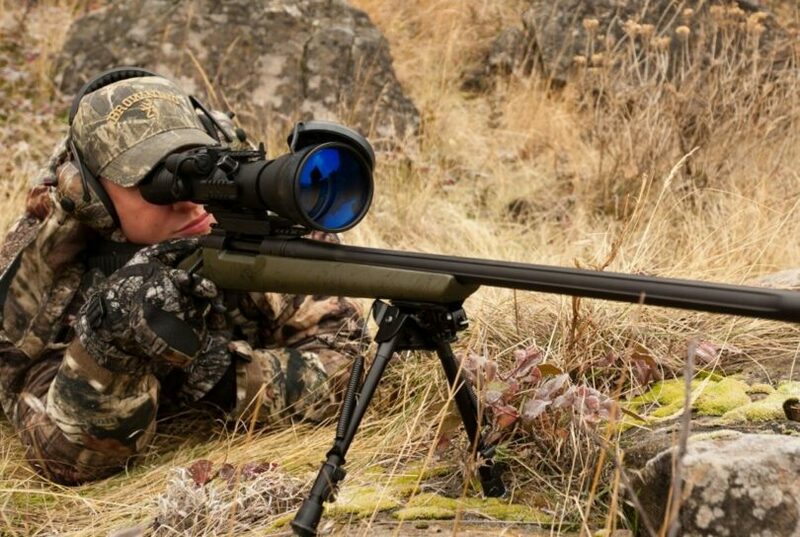 Among these best gen 3 night vision rifle scopes, we’ve thrown in a gen 1 scope too. It’s just so you can make a better idea of what quality looks like for different generations of items. The Pulsar Phantom MD Night Vision Riflescope is definitely a top notch gadget, thanks to its Gen 3 unfilmed image intensifier tube. This increases the scope’s sensitivity to light, thus rendering brighter images at a better 64-72 lp resolution. The Mil Dot Duplex reticle is another asset, allowing you to get a clear target. We love the 4x as this lets you see increased distance at a medium range, but the lens converter for obtaining the 6x isn’t included. 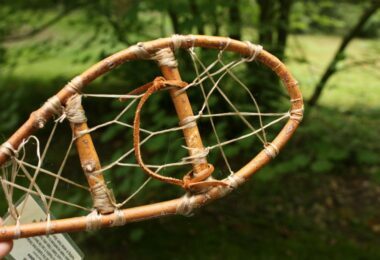 The 60 mm lens does wonders for maximum light transmission, so there’s no blur on your image. The 850 yards maximum range of observation tells you how far you can see at night, thanks to an 850 nm IR. This powerful infrared reaches 100 mW, so it’s great for tactical purposes. The housing screams durability too, as it’s made from composite and aluminum D16. Unfortunately, it’s also what puts it on the heavy side. Related: We recommend the Pulsar Challenger 2x Lens Doubler to increase the magnification of this scope. It’s fairly easy to set up, and the objective lens is pretty large. 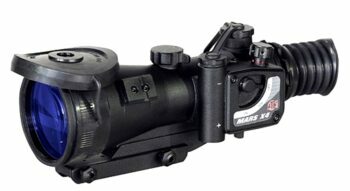 The ATN Mars Night Vision Riflescope features a 4x magnification too, for the medium range, and the optics are entirely made from glass. They’re also multi coated so you’re sure you’ll get a very crisp image. The 64-72 lp resolution can attest to that. The adjustable front focus is definitely a feat, and we love the nitrogen purged construction that doesn’t allow internal fog. The Mil dot reticle allows you to acquire the target with increased precision, and the crisp click windage and elevation adjustments are also accurate. We love the automatic brightness control and the day time cover with IR filter. The 450nm IR is easily removed from the tactical rail. The mount for both Picatinny or Weaver style rails is included in this package, which is great. On the other hand, the batteries required for it to work aren’t that great. The 3V CR123A battery is hard to come by, while the AA doesn’t last that long. Another disadvantage is the 9° angular field of view, which is narrow for the 4x magnification. 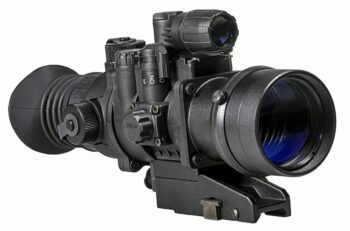 The Armasight Vulcan Night Vision Riflescope is an accurate scope with a 47-54 lp/mm resolution. The 3.5x makes it great for brush hunting, but you can get a 7x magnification with the magnifier lens. The 12° field of view is better than the ATN Mars, but it’s still arguably a bit narrow. We love the generous 45 mm eye relief though, and the red crosshairs reticle does a good job too. The 1/3 MOA windage and elevation adjustments are quite precise, and the detachable long range IR is great. The manual gain control might be appreciated by some users, while others would prefer something automatic which is more precise. 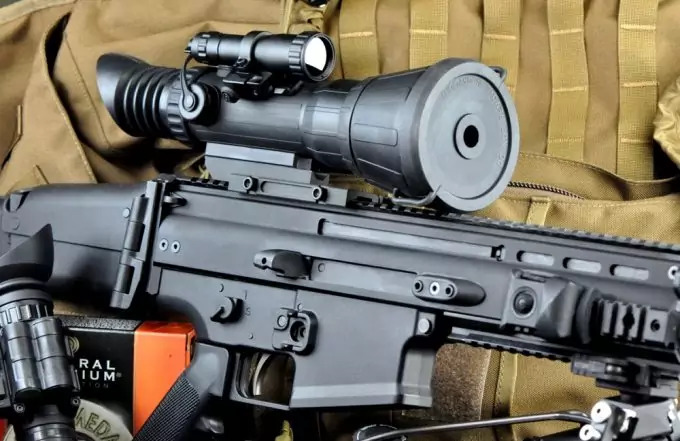 We do appreciate that this is the lightest, most compact scope in our reviews so far, as well as the multi coated all glass optics for increased light transmission. 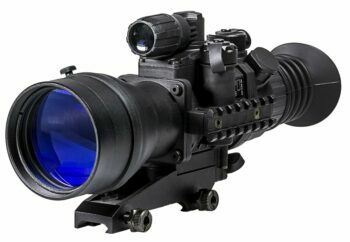 Related: If you don’t want this scope for tactical purposes, maybe a flashlight could be better? We recommend this Streamlight Infrared Active Illuminator. It works well for camping thanks to its long range infrared, but it can also be mounted on a Streamlight 69100 rail for hunting. 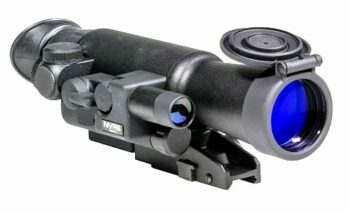 The Armasight NYX-14 Night Vision Monocular isn’t technically a gen 3 night vision rifle scope, but it can be used as one. 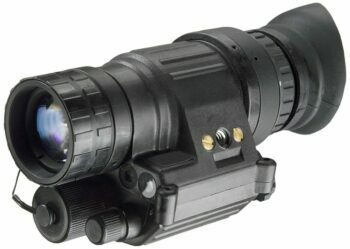 That’s because this monocular can be mounted on your head or on a weapon, and it allows black and white night vision. However, it won’t be as accurate as a scope since it has no reticle for target acquisition. 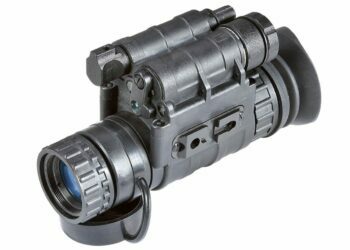 The manual gain control poses the same issues as the previous Armasight scope, but this monocular is ergonomic and it’s easy to use. 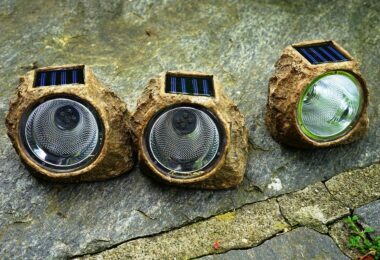 We love it’s compact and sturdy construction that makes it waterproof and able to withstand extreme temperatures. The 47-57 lp/mm resolution could be better, and the 1x doesn’t allow long range hunting. On the other hand, you can acquire the lens converter and get the optional 3x, 5x or 8x. And since you get a small magnification, the field of view reaches 40°, the biggest in our reviews. Related: If you’re interested in the middle observation range, you need the 3x lenses. We recommend the Armasight 3x Mil Spec Magnifier Lens because they’re light and easy to attach. The Pulsar Phantom Night Vision Riflescope is an accurate scope since it’s auto gated. With its unfilmed image intensifier tube, this scope is light sensitive, so you’re sure you’ll get the best 64-72 lp resolution. The brightness of the rendered images is also courtesy of the large 50mm diameter for the lenses, which allows a lot of light transmissions. The 3x is good for short medium range, and with the 805nm IR, you’ll be sure to see well as far as 700 yards during the night. 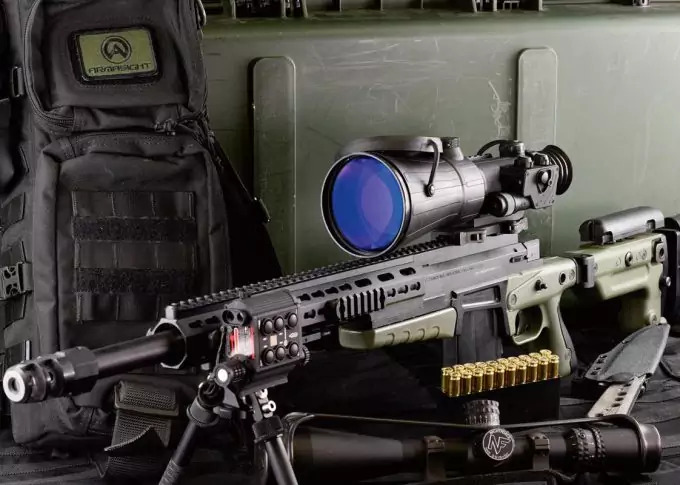 We love how powerful this 100 mW infrared is, and the Mil Dot reticle does its job. The fast return to zero courtesy of the quick detach is another plus. And that also allows you to use this scope during the day. On the other hand, the weight is on the heavy side, and the batteries are either short lived (the AA model) or difficult to find (the CR123A). We love the sturdy design though, and the IP67 rating shows how resistant this scope is to dust and rain, so you can use it regardless of the weather conditions. The Armasight CO-Mini Night Vision is the thing you need if you want to transform your day scope into the best night vision riflescope. 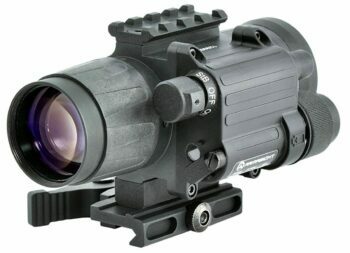 This is a system that works with scopes, sight or even binoculars, and you mount it at the front part of your rifle. We love the quick release mount and the wireless remote control best, but the long range IR is another plus. We’re not that crazy about the manual gain control, but we’ll admit it’s mil standard compliant, and particularly light. There’s no zeroing required, and the high 64-72 lp/mm resolution is a plus. The 1x magnification works well for brush hunting, but this system works with optics that go as far as 6x. Considering that, the 22° FOV is perfect for short range shooting. On the other hand, this system is arguably expensive considering you already have a day scope to use it with. In that case, a gen 3 night vision scope can be better in terms of budget and magnification offered. Related: If you don’t already have a day rifle scope, we recommend the ATN X-Sight II Smart Riflescope to go with this system. 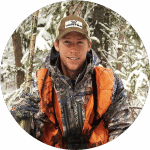 It has all the smart features, including GPS for accurate windage and elevation measurements, plus a 3-14x magnification for versatile shooting. The Armasight PVS14-3 Night Vision Monocular works well as a sight if you mount it on your weapon. But it can also be mounted on your head or on a helmet if you’re not using it for tactical purposes, and you still have your hands free. We love that this is waterproof and weatherproof, plus the controls show its ease of use. The resolution is 64-72 lp/mm and although there’s literally no magnification at just 1x, the field of view is large enough at 40°. We like the infrared that’s built inside the flood lens, though the 1.5 AA battery required to activate it doesn’t last very long. 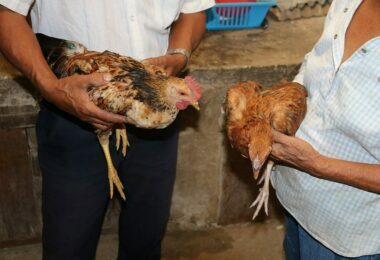 The compact dimensions and light weight are additional pluses. Related: We recommend the ATN Weapons Mount to go with this monocular, especially if you’re planning to use it for tactical purposes. 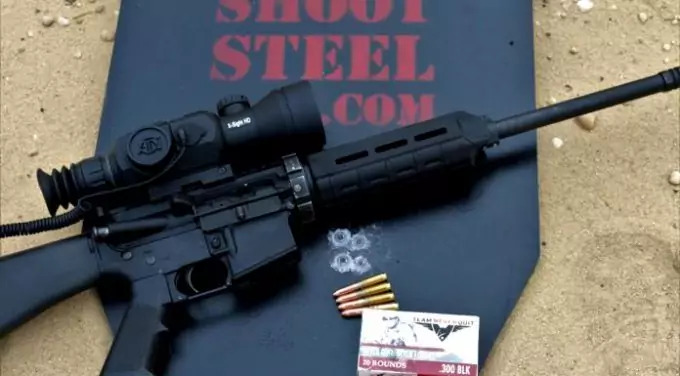 The Firefield NVRS Night Vision Riflescope is a Gen 1 device, and that’s why it’s obviously cheaper than all the above Gen 3 rifle scopes. But it can still be used for nighttime shooting, thanks to its incorporated 805 nm 100 mW IR light. On the other hand, the maximum distance you can use it for is 50 yards, and it doesn’t work well indoors, seeing as the environment is too reflective. Plus, you might notice a lot of black dots appear because the image intensifier tube isn’t that qualitative. The red duplex reticle is very clear though, and you can adjust its brightness incrementally. We love the 42 mm lens diameter for increased image brightness, though the 3x isn’t that good for long range observation or shooting. The 14ᵒ FOV is also a bit narrow, but this scope is durable as it has a titanium body and it comes with a quick detach Weaver mount. On the other hand, that titanium build is what renders it heavy, so it can destabilize your rifle. Related: We recommend the Firefield Compact Bipod for this scope if you’re not interested in the tactical, but rather the observational use. It’s an inexpensive, yet durable and light bipod, with rubber feet and tension adjustment for the pivot mount. You also get a Picatinny mount adapter with it, so that’s even better. You might decide on a versatile scope like the Armasight Vulcan for different ranges between the short and the long, or you might be happy with no magnification for brush hunting. You might want a powerful infrared LED like the one offered by Pulsar Phantom MD, or you might just feel content with a less bright IR. But it’s all ultimately up to you. Let us know what you end up choosing. What did we miss? What other, better Gen 3 scopes you would’ve liked to see in our reviews? The comment section is a scroll away.